Beverly Hills, CA (The Hollywood Times) 10/28/18 – Happy Together is ostensibly a comedy about a happily married, 30-something couple looking to re-energize their lives by bringing a young pop star into their lives in the form of a client looking for refuge from the paparazzi. But when the cast and producers sat down for a Television Critics Association panel, it became apparent that the show is about more than that. 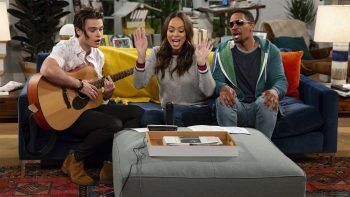 Accountant Jake and wife Claire, a restaurant and bar designer, are played by Damon Wayans, Jr and Amber Stevens West, with Felix Mallard as popstar Cooper James. Stephanie Weir stars as Claire’s mother Bonnie; Victor Williams as Claire’s father Gerald, and Chris Parnell as Cooper’s agent Wayne. Damon Wayans guest stars as Jake’s father in an episode airing tomorrow. 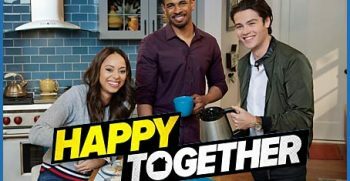 While on its surface, it’s an exploration into the dance between fame and mediocrity—Cooper enjoys the middling life of a suburban couple, while Claire and Jake revel in the excitement that comes with the media trying to find out more about Cooper’s recent breakup—the TCA discussion revealed that there’s more to it. Much more. Sienna Sanders of CBS Network Publicity, along with Megan Rugani, moderated the panel, which included Winston, executive producers Tim McAuliffe and Austen Earl, and stars Damon Wayans Jr and Amber Stevens West. And it’s not just about fleshing out the potential banalities of married life. Earl said that the chance to work with a dynamic with such fascinating chemistry was what initially drew him to the project. “Just as a writer, when you write a thing about marriage and then these two coming together, it’s like a once in a lifetime opportunity chemistry wise,” he told the audience. “Watching them bring these things to life has been the ultimate joy of my career so far”. Winston shared openly how a personal experience with his wife, in which they took in a member of One Direction for a time, directly influenced the concept and scripts. The two had a place in London, and Harry Styles had asked to stay in their attic for a few weeks. Winston said the fact of the matter is, even with Styles on the premises, nothing ever got quite that exciting; so the show takes creative license with the possibilities. Tomorrow’s episode “Like Father Like Son”, airing on CBS at 9:00 PM PT guest stars Damon Wayans as Jake’s father Mike. He comes to visit and spend some quality father/son time together, while Jake and Claire attempt to keep their love alive while she travels on business. Amber Stevens West’s father, legendary radio host Shadoe Stevens, also lends his voice to an announcer role in this episode. It’s funny, it’s poignant, and it’s filled with all the familiar elements of this sort of dynamic. Especially interesting is seeing Wayans and his son interact with such warmth and joy.